Sidewalk math is designed to engage young children in learning mathematical patterns by walking, hopping, jumping, and skipping through colorful designs on the sidewalk. Sidewalk Math has been collaboratively designed by math educators to build critical numbersense skills in young children, by designers to engage children in kinesthetic learning, and by early childhood educators to ensure caregivers feel confident in practicing counting and patternmaking with children. The Footbook is our 64 page full-color publication dedicated to the research, design, and production of our Sidewalk Math patterns. 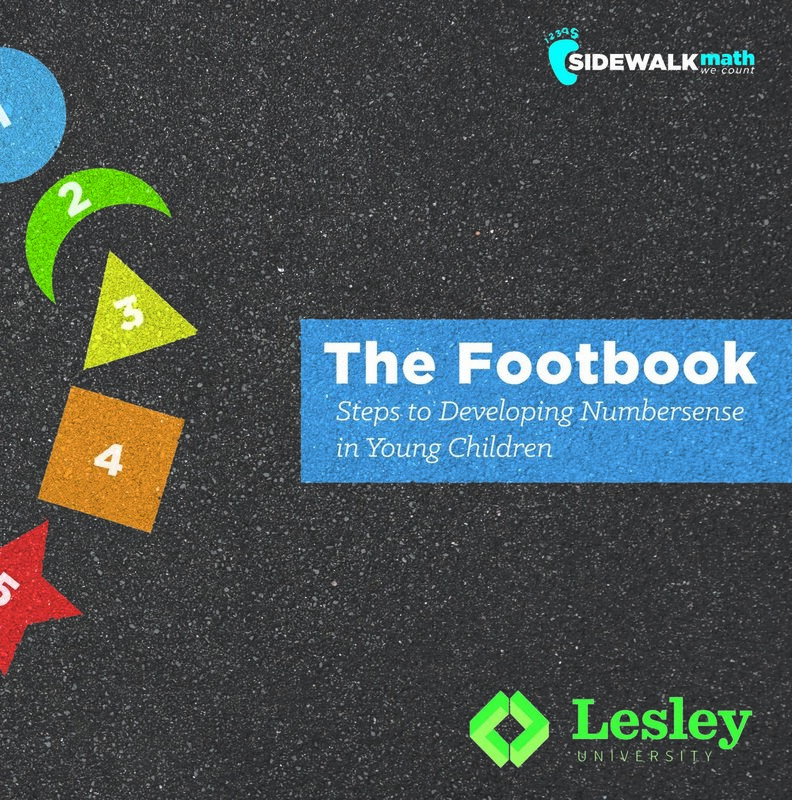 The Footbook provides all the steps to bring Sidewalk Math patterns and We Count workshops to your community so every child will count. Sidewalk Math is made possible by the collaboration of educators and artists from Lesley University's Graduate School of Education and College of Art and Design. The Lunder Art Center, finished in 2015, illustrates Lesley's commitment to interdisciplinary collaboration. Sidewalk Math is a project by Lesley's Creativity Commons, a physical and virtual space for scholars and students from across the university to engage in creative exploration of innovation in teaching and learning. The Sidewalk Math project is the brainchild of City of Cambridge community leader and mathematics educator Art Bardige. His creative idea for teaching math through sidewalk art inspired a unique collaboration of faculty and students from Lesley University, including design/education graduate student Ryan McQuade, mathematics faculty member Angela Vierling-Claassen, early childhood education faculty member Yvonne Liu-Constant, and creative arts faculty members Gene Diaz and Martha McKenna.